One of the key features of Python is that the actual core language is fairly small. This is an intentional design feature to maintain simplicity. Much of the powerful functionality comes through external modules and packages. The main work of installation so far has been to supplement the core Python with useful modules for science analysis. You’ll see import in virtually every Python script and soon it will be second nature. Importing modules and putting the module name in front is such a bother, why do I need to do this? It keeps everything modular and separate. For instance many modules have a read() function since this is a common thing to do. Without using the <module>.<function>(...) syntax there would be no way to know which one to call. Sometimes it is convenient to make an end-run around the <module>. prefixing. For instance when you run ipython --pylab the interpreter does some startup processing so that a number of functions from the numpy and matplotlib modules are available without using the prefix. A general rule of thumb is that from <module> import * is OK for interactive analysis within IPython but you should avoid using it within scripts. scipy.sparse.linalg.eigen.arpack Eigenvalue solver using iterative methods. Import the Linear algebra module from the SciPy package and find out what functions it provides. If you’ve gotten this far you have a working scientific Python environment that has most of what you will ever need. Nevertheless it is almost certain that you will eventually find a need that is not met within your current installation. Here we learn where to find other useful packages and how to install them. There are a number of sites specifically devoted to Python for astronomy with organized lists of useful resources and packages. The Python Package Index is the main repository for 3rd party Python packages (about 14000 packages and growing). An increasing number of astronomy related packages are available on PyPI, but this list misses a lot of available options. The advantage of being on PyPI is the ease of installation using pip install <package_name>. Find one or more Python packages that will transform coordinates from Galactic to FK5 ecliptic. Hint: tags are helpful at astropython.org and don’t forget the “next” button at the bottom. There are two standard methods for installing a package. If supplied with a package name then it will query the PyPI site to find out about that package. Assuming the package is there then pip install will automatically download and install the package. Will accept a local tar file (assuming it contains an installable Python package) or a URL pointing to a tar file. More information is available in the Installing Python Modules page. We strongly recommend against installing packages with --user unless you are an expert and really understand what you are doing, . This is because the local user version will always take precedence and can thus potentially disrupt other Python installations and cause hard-to-understand problems. Big analysis packages like CIAO, STSci_Python or CASA are carefully tested assuming the integrated environment they provide. If you start mucking this up then all bets are off. On Mac if you did not use Anaconda or the EPD Python Framework then you may see user packages within ~/.local/lib as for linux. This depends on whether Python is installed as a MacOS Framework or not. If you use Anaconda or a non-root Python installation then there is no issue with permissions on any platform since the entire installation is local to a directory you own. However, installing to a system-wide Python installation will require root or admin privilege. Installing this way has the benefit of making the package available for all users of the Python installation, but has the downside that it is more difficult to back out changes if required. In general we recommend using only the system package manager (e.g. yum) to install packages to the system Python. This will ensure integrity of your system Python, which is important even if you are the only user. There is no simple and fully consistent way to do this unless you use solutions like Anaconda or Canopy. The Python community is working on this one. In most simple cases, however, you can just delete the module file or directory that is revealed by the technique shown above. Dig in your heels and start reading the error messages to see why it is unhappy. Often when you find a specific message it’s time to start googling by pasting in the relevant parts of the message. You can also add paths to the search path using the PYTHONPATH environment variable. This is a practical problem that you are likely to encounter. Straight away you probably have the system Python (/usr/bin) and the Anaconda Python. Then if you install PyRaf, CIAO, and CASA you will get one more Python installation for each analysis package (there are good reasons for this). In general, different Python installations cannot reliably share packages or resources. Each installation should be considered as its own local Python universe. Now that you know about all the great packages within our Scientific Python installation, you might want to start using them in your PyRAF or CASA or CIAO analysis. If you start digging into Python you will likely come across the technique of setting the PYTHONPATH environment variable to extend the list of search paths that Python uses to look for a module. Let’s say you are using CIAO Python and want to use SciPy functions. You might be tempted to set PYTHONPATH to point to the directory in EPD where the SciPy modules live. 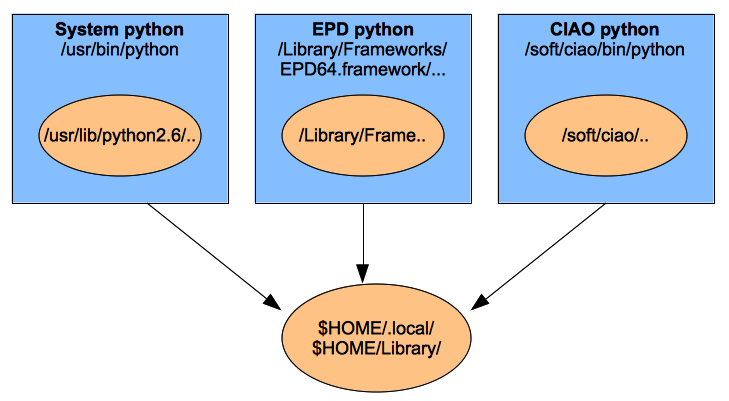 This will fail because the EPD Python modules were compiled and linked assuming they’ll be run with EPD Python. With effort you might find a way to make this work, but in general it’s not a workable solution. At the command line do which python to verify that python is the correct one from the analysis environment. Do rehash (for csh) then which pip to make sure the new pip got installed into your analysis environment path. Now you can do pip install <package> or python setup.py install for each desired package within that analysis environment. It’s worth noting that the original example of SciPy will not install with pip. It requires a very tricky installation from source, so unless SciPy ships with your favorite analysis environment you are out of luck with that one. If you do not have write access to the analysis package directories, then you need to use the --prefix option in pip to install in a local area and then set a corresponding PYTHONPATH. In some cases you can successfully share between Pythons. Although we don’t recommend doing this it is nevertheless useful to illustrate how this works. This technique is prone to breaking things in strange ways and we do not recommend it. Be sure to test that the package you installed works within the other Python environments. Virtualenv is a very useful tool for creating isolated Python environments. As seen in the linux non-root install it provides a way to make a virtual clone of an existing Python environment. This clone can then be used as the package installation location. One use case is wanting to install a new or experimental version of a package without overwriting the existing production version in your baseline environment. For a good introductory tutorial see http://iamzed.com/2009/05/07/a-primer-on-virtualenv/. The Anaconda Python distribution, in conjunction with the conda package manager, makes it easy maintain multiple Python environments under one tree. This is extremely useful if you need to install different versions of packages, perhaps for testing or for running a particular application which has certain package requirements. See Python Packages and Environments with conda for an introduction. Go to the APLpy install page and read the instructions. Manually install all of the Python package dependencies with the --user option or try the auto-install script available there. For extra credit install the Montage C library as discussed on the APLpy install page. Then try to run the example Making a publication quality plot that was shown in the introductory talk. The necessary input files are in the install_examples.tar file. Install HDF5 and PyTables. This will let you read HDF5 tables in Python. HDF5 is a data file format which can store and manipulate extremely large or complex datasets in a scalable manner. It is the baseline for some data-heavy facilities such as LOFAR. Attempt to follow the instructions for building from source in the Installing SciPy page. (No binary downloads!). This will be useful if you want to use the very latest development version of Python or else want to use the system-dependent build optimization so your numerical libraries are the fastest possible. For most people this is not needed. If you can do this then consider yourself an expert on Python installation. Where does Python look for modules?